Memphis Forklift Certification, Get Employees Forklift Training today! Memphis forklift certification is required for all area employers. If your employees don’t have their forklift certification in Memphis and don’t know where to turn, contact CertifyMe.net today. Our Memphis forklift certification and training programs include the most comprehensive and convenient training options you’ll find anywhere. All you have to do is sign up, and we’ll get your training program off the ground today. OSHA requires that all employers are responsible for forklift certification in Memphis. Problem is, most firms aren’t sure how to do this. With CertifiyMe.net, affordable and effective forklift training in Memphis TN is only a click away! If you’re a forklift operator in Memphis, completing your forklift certification and obtaining your license could potentially save your employer thousands of dollars in OSHA fines. It is a requirement for all those operating a forklift to be trained by OSHA standards. For employers, it’s against the law to willingly have someone operate a powered industrial truck without Memphis forklift certification. If you’re not sure about your current compliance gaps, it’s always a good idea to sign up for forklift certification in Memphis today! Where Can I Sign Up My Employees for Forklift Training in Memphis, TN? Forklift training and certification in Memphis is easier than you think – and more affordable, too. CertifyMe.net is the number one provider of online forklift certifications and can get your employees trained in no time. Our program takes only about one hour to complete and can be accessed on any device with an internet connection. 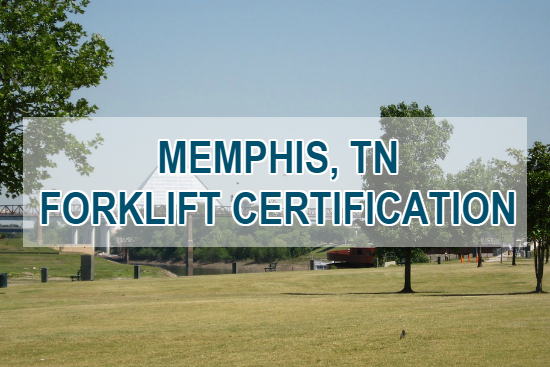 We’ve made Memphis forklift certification more accessible than ever before. We know how important safety is on the job – for your employees, for your bottom line, for everything. In addition to an extremely convenient and fast program, you also get the credibility of OSHA-compliant training. Our online forklift courses are 100% compliant with all OSHA standards, and we consistently update our programs with OSHA’s latest regulations. Enjoy top-quality forklift certification in Memphis whenever you need it – 24/7/365! If you’re ready to start your new life in Memphis, set up an account on CertifyMe.net and complete your forklift training Memphis today! If you have any questions about forklift jobs in Memphis, TN, or if you’d like to speak with our forklift training experts, please visit our contact page, or give us a call directly at 1-888-699-4800. We’ll help you acquire the best possible forklift certification in Memphis, TN – all at the best possible price. To view all of our Memphis forklift certification and training options, check out our course catalog. Thanks for considering CertifyMe.net for all of your Memphis forklift training needs – we look forward to serving you today!